Back when Joaquín 'El Chapo' Guzmán was captured in February 2014 in Mazatlán, Mexico, the Sinaloa Cartel leader was not alone: with him was his newest wife, former beauty queen Emma Coronel. Much speculation has surrounded her, especially since she's the mother of El Chapo's twins. However, when Coronel gave birth to the children, she left the father's name blank on their birth certificates, presumably to protect them and herself. After Guzmán's second escape from jail in July 2015, it is being said that Coronel and her twins are staying in the city of Lancaster, California, and that it's most likely that El Chapo won't visit them for now. Here are 4 other things to know about Emma Coronel, the myserious young woman who has been married to Mexico's most powerful druglord for seven years. 1. A Former Beauty Queen. Joaquin 'El Chapo' Guzmán reportedly fell in love with Emma Coronel when he saw her at a beauty pageant in the neighboring state of Durango back in 2007. Competing in La Gran Feria del Café y la Guayaba 2007, Emma Coronel was just 17. 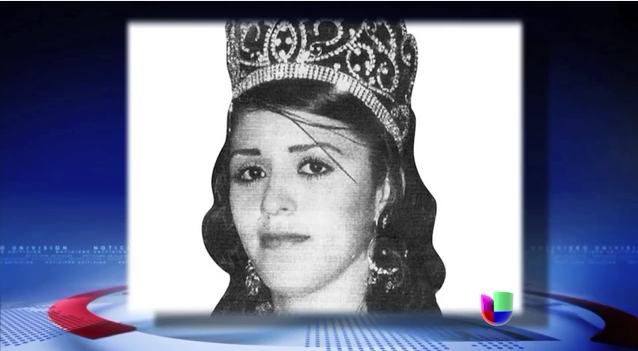 Struck by her beauty, El Chapo exerted his influence to ensure the girl won the pageant. El Chapo wooed the young Coronel, who eventually married him on her 18th birthday in an elaborate ceremony. El Chapo was 47. 2. A Cartel Kid. Emma Coronel didn't just marry into a life in the cartel - she was born into it. The 5'6" beauty is reportedly the daughter of deceased drug kingpin Igancio "Nacho" Coronel, who was a key member of the Sinaloa Cartel and one of El Chapo's right hand men. Nacho was known as "The Crystal King" for his role in ensuring the widespread sale of crystal meth across the United States and Europe. He was killed in a shoot-out with the Mexican army in 2010. 3. A Young Mom. Coronel is 26 years old and the mother of twins. She gave birth to two little girls in 2012, when she was 23. El Chapo sent her to California to give birth to his daughters so that they would grow up with American citizenship. She was on the radar of the DEA, however, as no formal charges could be laid against her, there was nothing authorities could do. She returned to Mexico after giving birth, living with Guzmán in Culiacán. 4. An American. Coronel is actually an American citizen herself. While her father was Mexican, her mother was American and therefore she holds both passports. There has not yet been word from governments of either Mexico or the United States as to whether Ms. Coronel-Guzmán will be charged with any crimes.